We’re moving to the Aurora Pocket Neighborhood soon and looking to seriously downsize. Lucky for you, we have tons of nice stuff to get rid of! Thanks and hope to see you there, for barter or worse!!! 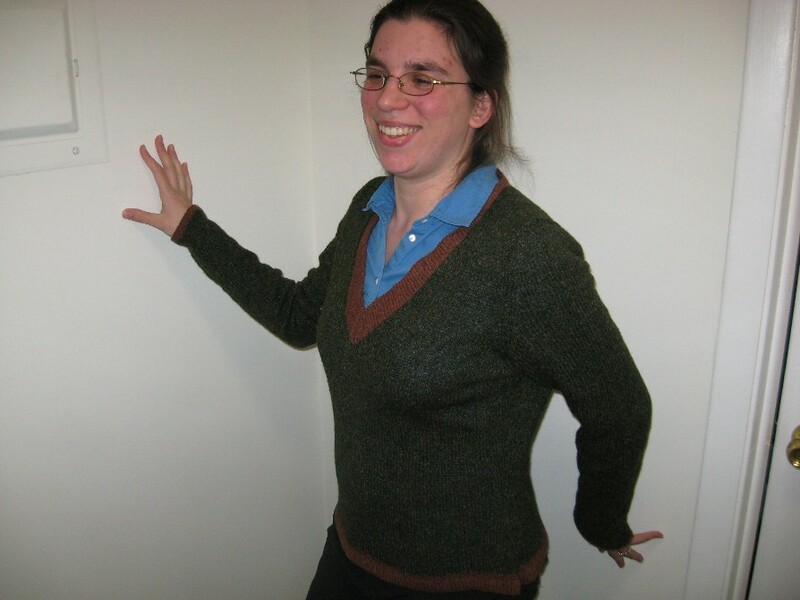 Anyone can host their own swap and here’s one coming up! 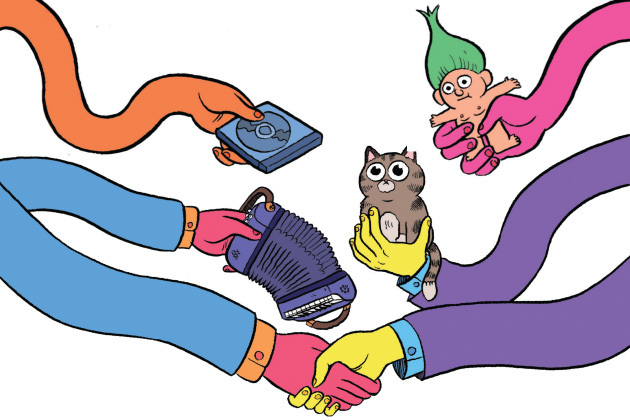 What: Bring anything that you would like to trade, give, swap or sell cheap. Focus on educational materials, books, and games, but household items, clothes, etc. are welcome. Please be prepared for the possibility of bringing some things home if necessary. When: Tuesday, 7/10 4pm to ~7:30. This will also be a potluck for those who would like. Bring music, instruments, etc, to play too! Email me with any questions/thoughts/pointers. Support Share Tompkins and check out Fire on the Water Studios, a fresh gallery and art education space, while swapping your goods and making new friends! Don’t have anything to trade? Don’t worry! Come empty handed and see what relationships you can foster. Contact McKenzie (717-903-4871/grasswriter@gmail.com) with any questions. 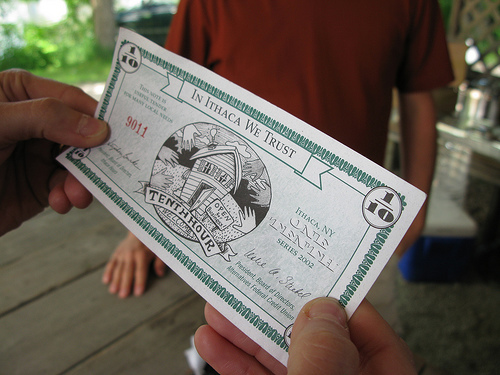 Check out this event, organized by some Occupy Ithaca folks! Looking for some interesting gifts for friends and family but not looking to break your bank account? Need to get rid of some stuff? 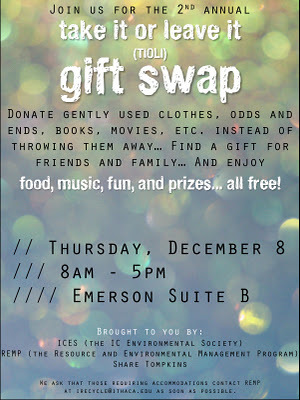 Come to Ithaca College’s Take It Or Leave It sustainable gift swap, where you can do both of these things! 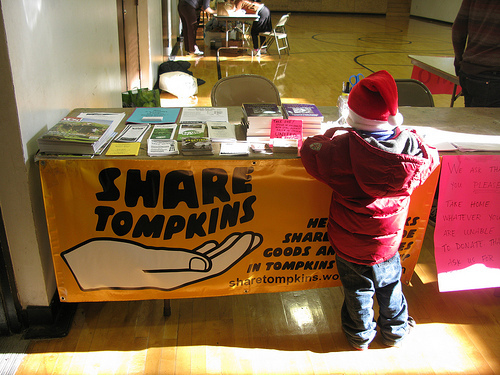 The gift swap is brought to you by ICES (the IC Environmental Society), REMP (IC’s Resource and Environmental Management Program), and Share Tompkins. Donate your gently used clothes, odds and ends, school supplies, kitchen supplies, books, movies, etc. to the gift swap and avoid sending it to the landfill. And rather than buying something new and increasing demand for extraction of natural resources, you may find something that one of your loved ones could really use or appreciate. The event will be held Thursday, December 8th, from 8am – 5pm in Emerson Suite B in Campus Center at Ithaca College. Drop off your donations as early as 8am or any time throughout the day until 5pm, and browse for as long as you wish. There will also be food (including vegan hot chocolate! ), music, and fun such as face painting and hula hooping, and space to just take a break and kick back. We will also be raffling off sustainable items and gift certificates to local businesses, such as Finger Lakes ReUse and Collegetown Bagels. This event is entirely free and open to the public. The more the merrier! For additional info and individuals with disabilities requiring accommodations contact Margaret Keating.